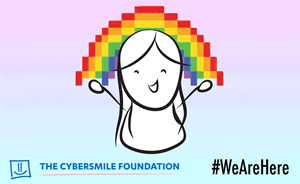 The Cybersmile Foundation are launching a new online initiative to combat the effects of cyberbullying and digital abuse with the help of virtual hugs. Trained support advisors will use the Twitter platform to actively search for individuals who express negative feelings and respond with tweet empowerment, and a virtual hug to encourage positivity and wellbeing among users. According to recent studies*, 50% of teens have been bullied online while a majority of young people fear that digital abuse is on the rise. 87% of those participating in a recent survey conducted by McAfee also witnessed some form of cyberbullying. People expressing negative feelings and emotions will be presented with a fun animated gif to brighten up their day, with the hashtag #WeAreHere so that other users can also find support and encouragement. Keywords such as 'sad', 'unhappy', and 'miserable', will be monitored to ensure users who are facing difficulties and need advice get assistance quickly. The Cybersmile Foundation will also provide professional help to people suffering from depression and users discussing 'suicide' on social networks. Adults as well as children can also log on to the Cybersmile Help Centre for more information or request live support from a Cybersmile support advisor. With millions of people using social media every day to connect, play games and share stories, online bullying remains a big problem for many services and stakeholders are keen to take action to support victims of digital abuse.